Starting in September 2015, Grenoble Ecole de Management (GEM) will provide students in its Grande Ecole program with the opportunity to study for one semester at Downing College, a constituent college of the University of Cambridge. Thirty students selected on the basis of their application will be able to partake in this fourth Transcontinental Track program which allows GEM to offer its pedagogy on campuses worldwide. "Cambridge is part of a strong ecosystem built around technological innovation, much like GEM within the GIANT innovation campus. It was therefore natural for our two institutions to develop such a partnership." explains Mark Thomas, Director of the GEM Center for International Affairs. Like the first three Transcontinental Track programs, this fourth agreement is not simply an exchange program. Students will be able to continue following the GEM Grande Ecole curriculum while studying on the Cambridge campus. "They will be integrated with Downing College students and their classes will be taught 50% by GEM professors and 50% by professors from Cambridge." adds Mark Thomas. The program provides a mix of classes and company visits with key market players such as Bloomberg, JP Morgan and Natixis in New York or Amazon, Microsoft and Boeing in Vancouver. 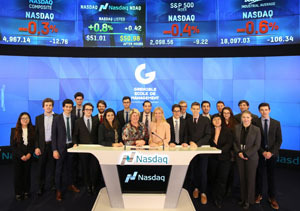 On March 4, 2015, students in the New York program were welcomed by the NASDAQ during the traditional "Closing Bell Ceremony." The School's logo was displayed on the screens of this financial giant for the second time in three years.